3.3 out of 5 based on 12 bloggers and 7 commenters. Infinite is a free premium blogger template with 2 columns, responsive design, right sidebar, gallery-styled, an exclusive design for Blogger, ads ready, social bookmarking icons, posts thumbnails, tabs, drop down menu, breadcrumbs, a background pattern, related posts support, well designed threaded comments, 404 error page customized, neutral colors and pinterest style. 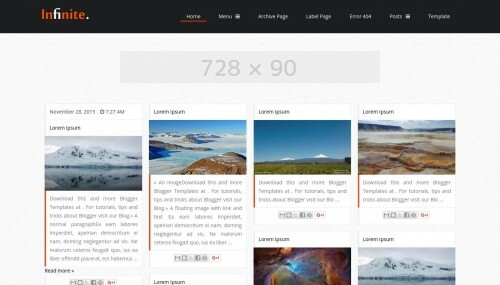 Excellent template for blogs about any general topic, business, photography or a personal portfolio site. Congratulations on beautifully templetes !!! can give me the same templete with extra google map position ? Hello dim, thanks for the comments! i wish HAPPY NEW YEAR !!! have you other tamplete like Infinite who have google map for every post ? Hi dim, I think the easies solution I can think on is to add the embed map code( https://developers.google.com/maps/tutorials/fundamentals/adding-a-google-map ) to each post. down from navbar , can i have 2 or 3 or more columns widgets? Hi, I’ve tried to change the link for social icons but it doesn’t work. How can it be solved?